I’ll cut straight to the chase with this blog post. Rikki Hunt, Chief executive of Digital City (UK) Ltd and it’s parent company Avidity Consulting Ltd, (Avidity Consulting owns 30% of Digital City), has transferred control of ‘his’ 30% share of Digital City (UK) Ltd to his wife Laura. He effected the change of Directorship on December the 31st 2010. Since that point the cabinet of Swindon Borough Council has been falling over itself to blame the failure of their WiFi’asco onto anybody except themselves. Cabinet members, pathologically incapable of accepting any blame for the potential loss of £400,000 of public money, have sought to blame the failure of the WiFi’asco on ‘politically motivated industrial espionage’ orchestrated by members of Swindons Labour group – this piece of disinformation is as as spiteful as it is demonstrably untrue. As Swindons Conservative councillors run around trying to organise a political rescue for the sinking WiFi’asco, they appear to be deliberately ignoring the fact that the Chief Executive of Digital City (UK) Ltd has already boarded his pre-prepared lifeboat and has been quietly rowing away from the stinking sinking ship since late last year. From the very beginnings of the WiFi’asco SBC cabinet members have stubbornly, no, aggressively resisted each and every attempt made to rescue them from their own stupidity, arrogance and ineptitude. Systematic failings, mistakes, strange decisions, illegalities and questionable practices have been pointed out to the cabinet of Swindon Borough Council at every step but, unless correspondents have been in 100% agreement with the ‘official’ party-political Bluh-line on WiFi, all of them, even critical friends of Rod Bluh’s WiFi pRodject, have been derogated, called liars, misinformants, trouble-makers, scare-mongers and wifi-deniers by those in ‘control’ of the WiFi’asco – despite being invariably and demonstrably correct in almost every aspect of their many enquiries, comments and criticisms. For their part, the ‘Officials’ who rail-roaded the WiFi scheme into existence, (in a way which almost guaranteed its failure), have proved themselves to be lacking in even the most basic ingredients and skill sets necessary to the schemes success. 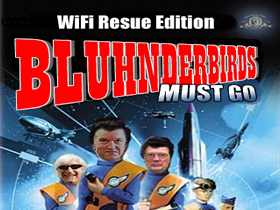 I think it is fair to say that the Civic and Business Community has now lost patience with Rod Bluh and his Bluhnderbirds and that a weary recognition that the town cannot save those who will not only not lift a finger to save themselves but aggressively resist help, the town can at least try to save itself from them. Even Rikki Hunt seems to be doing exactly that…..
Dumb de dumb de dumb de de dumb de dumb – Dar!